What earned Mnuchin that title? He went out of his way recently to praise Trump's equivocation about race-haters in Charlottesville and also said he totally agreed with Trump that football players shouldn't take the knee (unless they were bowing to Trump). Neither issue has anything to do with Mnuchin's business at Treasury, but Trump needs constant praise and Mnuchin knows how to dish it. In the famous June 12th Cabinet meeting, a landmark in lickspittle scrambling, Trump insisted on hearing praise of himself from every single official sitting at that large table. Only Defense Secretary Jim Mattis refused to play, praising the men and women of the armed forces instead. 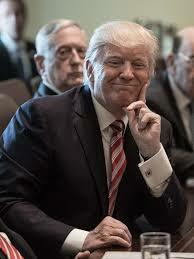 From all the others, Trump heard "thank you soooo much for the opportunity and blessing that you’ve given us to serve your agenda" and “It’s an honor to be able to serve you” and “I am privileged to be here -- deeply honored” and “What an incredible honor it is to lead the Department of Health and Human Services at this pivotal time under your leadership,” said the now disappeared Tom Price. The photograph of Trump's face while that fawning festival proceeded perfectly captures his needy babyhood. Tell me more about how great I am, because I am just that seriously damaged as a human being and insecure because my mother never loved me and my father never hugged me. The "adult day-care workers" in the Trump White House, the lowly staffers who don't own a cabinet rank and don't get to travel on chartered jets, know who they're working for. They praise and fawn and lick that spittle while the country goes to hell on impulse. According to Ashley Parker, "when his advisers hope to prevent Trump from making what they think is an unwise decision, they frequently try to delay his final verdict — hoping he may reconsider after having time to calm down." Put the baby in "time out." And always -- always -- tell him what a good boy he is. "One defining feature of managing Trump is frequent praise, which can leave his team in what seems to be a state of perpetual compliments. The White House pushes out news releases overflowing with top officials heaping flattery on Trump .... Especially in the early days of his presidency, aides delivered the president daily packages of news stories filled with positive coverage and Trump began meetings by boasting about his performance, either as president or in winning the White House...."
A boasting man, surrounded by sycophants, does not ground this country in any useful reality.